They could all be lying, just like Trump's 14 accusers could all be lying, but that seems unlikely to me. Ford's testimony was convincing enough that Republican Senators Flake, Murkowski, and Collins, as well as the American Bar Association and a great many others have called for an FBI investigation to be conducted before moving forward. I don't think Ford is lying, I think she honestly believes what she is saying. I don't think Kavanaugh is lying, I think he honestly believes what he is saying. Someone is 'misremembering', and so far there is no corroboration for Ford's recollection of what happened. None of the people that Ford claims were present can remember the incident in question, even her friend. Comparing Kavanaugh with Trump is yet another smear IMHO (especially when Trump does it). Trump is a known liar. Trump has bragged on a hot mic about assaulting women. And Trump is a fundamentally immoral person. So I have no doubt that many of the accusations of sexual harassment and assault against Trump are true. None of that is true for Kavanaugh. Kavanaugh is not perfect, but his behavior towards women since high school is the polar opposite of Trump's. And the behavior described by Kavanaugh's accusers is inconsistent with the behavior consistently described by those who have actually known Kavanaugh since high school. In retrospect, I think an FBI investigation will probably provide the best opportunity for Kavanaugh to clear his name (at least for those who are actually interested in the truth). There is already enough data out there to demonstrate that Ford's uncorroborated testimony regarding Kavanaugh is inaccurate. But hopefully it will have more impact if that analysis comes from the FBI. I think that is part of the reason Flake pushed for the investigation. First, it will remove one talking point from the anti-Kavanaugh smear campaign. Second it will somewhat (but not totally) diminish the tarnish that Kavanaugh's character has received as a result of the Democratic smear campaign when the FBI validates what we already know... there is absolutely no contemporary corroboration for the claims that Ford has made against Kavanaugh. "Rachel Mitchell, the Arizona prosecutor who questioned Christine Blasey Ford at Thursday's Senate Judiciary Committee, privately told GOP senators she would not prosecute Supreme Court nominee Brett Kavanaugh based on the evidence she heard, according to the Washington Post." I am confident that the FBI will come to a similar conclusion after its investigation. How can you do it? This smearing is exactly how Democrats work and they have done it for years and years.Have you forgot about all of the people who have been smeared by the Democrats before? This is what they do.And now they are doing it to Kavanaugh.How can you believe both are telling the truth? One of them HAS to be LYING and it is her.Yet when it comes to Trump you believe them but not for Kavanaugh? Are you biased? We know who Donald Trump is and we knew how he was before he even ran and this is why we voted for him.Donald Trump is not some new person that we did not know about and he was liked by both Republicans and Democrats before he ran for President and the political smearing from the Democrats started.Plus,we researched Donald Trump and his history is clean,plus he has not changed much politically in 40 years,except that now he claims to be a Christian and is now pro-life and he has proven he is pro-life compared to any Republican President in the last 40 years. As far as the hot mic,it was just guy locker room talk about babes,is all,and it is not proof he sexually assaulted women. Have you ever heard of groupies? They throw themselves at rock stars and rich successful men.This is why no matter what the MSM said about him we knew it was lies,and we still know they are lies.It just goes in one ear and out the other because they have no credibility and this is why Trump won regardless of the smears on him,with everything stacked against him,he still won.People no longer believe the Democrats and the MSM.It does not matter what they say,they are known as liars who have no credibility.Just like with Kavanaugh now. It is like you have selective memory when it comes to the smear tactics the Democrats have used for years. Who are you going to thank when Roe vs Wade is overturned and sent back to the States for them to decide it? It'll be Donald Trump.It won't be Ronald Reagan as good as he was and it won't be George sr or W and W talked like a Christian and ran as a pro-lifer and he turned out to be a wolf in sheeps clothing. How can you believe both are telling the truth? One of them HAS to be LYING and it is her. I didn't say I believe both are telling the truth. I believe Kavanaugh is telling the truth. I believe that Ford is telling what she has convinced herself is the truth. Just because my personal evaluation of their testimonies is that neither is deliberately lying, that does not mean that I believe both are telling the 'truth'. I do not know why Ford appears to believe what she believes. I do know that so far there is no contemporary corroboration to indicate that what she believes is the 'truth'. Many people for many different reasons believe things that are not 'true', but that does not mean they are deliberately lying when they make factually inaccurate assertions that they believe to be true. I do not fault Ford (except for possibly her memory of events that took place 35 years ago when she was a teenager) in all this. I do fault those who are taking advantage of Ford's uncorroborated assertions to smear a good man for political purposes. Despite the fact that Ford's claims were totally uncorroborated and Ford had stated that she wanted anonymity, the Democrats leaked her uncorroborated assertions to the press in a last minute effort to smear Kavanaugh's personal and professional reputation and delay his confirmation. IMHO both Ford and Kavanaugh are victims of the Democrats deplorable behavior. It's not just Ford, it wasn't just high school, and it's not just Flake. It appears that a pattern is starting to emerge. Ed: It's not just Ford, it wasn't just high school, and it's not just Flake. It appears that a pattern is starting to emerge. C'mon, Ed! Now you're not being objective at all! Can't you tell the difference between a pattern of accusations that can't be substantiated, that have many problems, and in facts that we can examine and know? So many are asserting what they can't know as if it were the unquestionable truth. DB: I don't think Ford is lying, I think she honestly believes what she is saying. I wonder why she was in therapy to begin with - we've not been told. And why do the therapy notes contradict what she now asserts - about the number of people in the room. The YEAR. Her AGE. And her assertion that she first became alarmed about Kanvaugh being on Trump's short list was well before his name was put forward. And who was her therapist - what credentials? I wonder if this could be part of some supposed "recovered memories" therapy? Look, I can very clearly remember specific incidents across my youth - from ELEMENTARY school - and she doesn't know how old she was or even exactly what year it was? This just doesn't add up! But I agree that she believes it. She also may be willing to lie for what she considers the "greater good" - that she will prevent another solid conservative getting on the court. Or that her testimony will prevent the eroding of abortion "rights." Or she hates Trump so bad she feels she must stop him at all costs. There are many possibilities. We seen a entire cast of celebrities and well known people absolutely loosing their cookies over Trump and conservatives. And we know many of them are well-motivated to lie. BTW, unless some new and credible information emerges that adds to what we already now about Kavanaugh or what supposedly happened to his accuser, I'd like to know just what the FBI (or anyone) is supposed to investigate - that by now hasn't been over and over with laserbeam intensity? Vapors of high school ghosts of the past? Some newly discovered high school annual? Emotions? 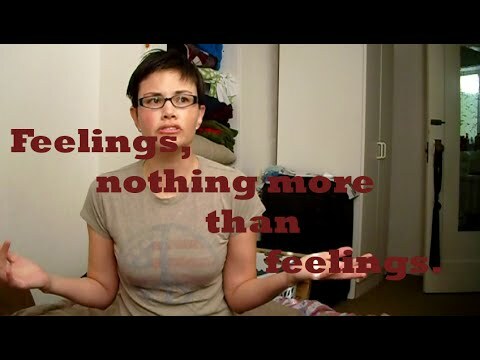 Feelings? What year do you zero in on? What house? ANYTHING that can be corroborated???!!! The only people who are certain Kavanaugh is guilty are those who haven't used examinable facts to determine the issue. Seems their guiding determinate is the first line of the lyrics of that infamously sappy song: "Feelings, nothing more than feelings..."
*Congress of the United States begun and held at the City of New-York, on Wednesday the fourth of March, one thousand seven hundred and eighty nine. Amendment 5 and 6 shall be waived against all Christians, Conservatives, Constitutionalist, and on all who disagree with Cultural Marxist Values, Rules, and progressivism. They shall be guilty of accusations and have no right to defend themselves due the nature of their crimes against humanity. For the sole higher purpose of increasing social justice, no Christian, Conservative, Constitutionalist, and all who oppose socialism, therefore, all rights contained in this Bill of Rights no longer can or will apply to them. Yes, I am wondering if those on the left really realize whom the true fascist are? In my former field of criminal justice we received sufficient training in reading body language. With all due respect to Ford, she read from a script and continually look down towards the right or left. She could not remember details concerning events happened 7 weeks ago or who is paying her lawyers. She looked up on that one. Looking down, reading from a script voice tone and demeanor - indicates one of two things: She is out right lying or being forced to lie and did not want to be there in the first place. Kavanaugh's body language and words indicate one who is telling the truth - he looked and addressed folks in the eyes and never avoided direct eye contact. His posture was fixed and upright and for good reason emotional at the fact that there are people who want him destroyed and dead. If this sort of thing does not stop, someone will die but the left does not care, they want that. What sanctimonious hypocritical democrats, who attacked the women that Bill Clinton did raped and molested while they spoke truthfully and in the eye and with emotion - their character was slaughtered by some of these same Marxist of that party. OK but it did seem like you were implying they both were telling the truth to me but I could tell you thought she is just not remembering who it was.I listened and did not believe her.Maybe you forgot but the Democrats did this same thing to judge Roy Moore of Alabama costing him the election.And now they are just using the same playbook against Kavanaugh.It is what they do lie and smear political opponents. The good news is it does not work and this is only backfiring on the Democrats with the mid=terms elections coming up.Nobody believes them enough to really matter.This is why I'm not worried at all.I know the Democrats and the MSM no longer have the power to effect politics like they use to.They still fight but have lost so much power and credibility. They have totally wasted their time with all of the attacks on Trump.They are fooling themselves into thinking it is working,when it is'nt like it use to. Like I said they look like idiots and Trump just exposes them even more as they do it. It is known as Trump Derangement Syndrome they have and all they offer America is Trump hate and obstruction no reason at all for them to get people to vote for them. What I'm seeing is a pattern of accusations so recent that they have yet to be investigated. Some may be asserting that all of the accusations are 100% true and Kavanaugh is a dirty liar, but I'm not one of them. I want to see a thorough investigation so that the truth can be established before the vote. I think that's reasonable. You guys are going to get your hard right, socially conservative, judicial activist one way or the other, and the majority of the country (myself included) are going to be pissed about it, but I think we'll all feel a little bit better if the GOP takes the time to ensure that their guy is at least a decent person. President Trump has agreed to allow the FBI to take a look at this.What is the problem? It could happen to you Ed,my liberal misguided friend.You take any woman out on a date and she goes psycho on you and accusses you of sexually assaulting her without any evidence and yet you're already guilty and have no chance to prove your innocense,even when you provide documentatation that shows you were out of town when this was supposed to have happened.It won't matter Ed because you're already guilty just because she and they say so. Thou Shalt not bear false witness. Due process doesn't factor into it. This isn't a trial, it's a job interview. Credible allegations are absolutely enough reason to decline to hire an applicant. Also, there are apparently four women making similar claims, not just one. And comments in his yearbook paint him as a party boy at a party school. There's no evident fire just yet, but there's a lot of smoke there. Incidentally, the recent allegations of sexual impropriety have overshadowed questions about his finances (and therefore his independence from outside influence) and his supposed ignorance of the fact that his mentor his mentor, Alex Kozinski, had a decades-long history of inappropriate sexual behavior in and around the workplace. Again, no fires evident, but that's a lot of smoke. It makes me think of something that happened in my home town, back when I was a kid. I grew up in a town of 10,000 people. It was about an hour north of Boston, right on the highway. That made is convenient for people from Mass to come up and frequent our local businesses. One of those businesses was a brothel. Everybody knew about it. It was a source of fascinated amusement around the middle school and a dare at the high school. My uncles cracked jokes about it at family gatherings, as did my friends fathers'. Literally everyone in town knew about it, apart from the Chief of Police. The DEA and FBI busted the place when I was in college, and man were the local cops ever shocked and dismayed to discover that a brothel had been operating under their very noses for more than 20 years. Some folks (actually everyone) thought (actually knew) they were maybe a bit too shocked (and clearly lying). I suspect that there's some of that going on in some of Kavanaugh's denials. Anyway, maybe the GOP should cut their losses, use this supposed injustice to fire up their base, and pick some other conservative judge for the spot. When a person is accused of ANYTHING, innocence must be maintained until proven guilty, especially when all there is are allegations. Due process is the legal requirement that the state must respect all legal rights that are owed to a person. It is not JUST about a trial. What does that even mean? What rights is the State denying Kavanaugh? Are you saying that the Senate is infringing on his rights by taking Ford's allegations seriously? When uncorroborated accusations are used to publicly defame any person's private and professional reputation, I think that is a clear infringement on that person's fundamental rights. So I agree that the Democratic campaign to publicly smear Kavanaugh's reputation and delay the confirmation does violate Kavanaugh's rights as a US citizen. I believe the Senate should have investigated and corroborated the allegations against Kavanaugh before any public hearings occurred. If there was adequate corroboration to justify a public hearing, then of course go public. What we have seen over the last couple of weeks was the Democrats publicly smearing Kavanaugh's reputation and violating Ford's request for anonymity in a last minute effort to delay Kavanaugh's confirmation. The Democrat's behavior towards both Kavanaugh and Ford has been pathetic.